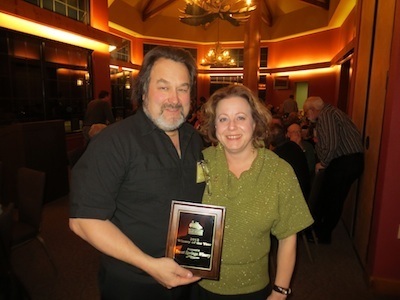 Steve & Andrea DeBaker with the 2014 Winery of the Year award. Trout Springs Winery, which is owned by husband-and-wife Steve and Andrea DeBaker, is actually a division of Branch River Farms--Wisconsin's only licensed fish hatchery, plant nursery, and winery all under one roof! Unique all right. Just like the man behind the scenes. Steve can best be described as a self-educated entrepreneur. A dreamer and a doer. After graduating from high school, Steve embarked upon a series of widespread ventures that included everything from founding a theater group called "Not Ready For Mime Time Players," to business doings in equestrian enterprises, taxidermy, and duplex rentals. In 1985, he formed STAFF Enterprises, which eventually evolved into Branch River Farms and its subsidiaries Branch River Trout Hatchery and Trout Springs Winery. ​He also founded the Wisconsin Water Gardening Foundation and is a longtime member of the Wisconsin Aquaculture Association. Andrea is a nurturer, a natural gardener, which comes in handy when you're growing grapes. What started out as a single 20' x 15' rose bed sprouted into an acre-and-a-half of herb, flower and vegetable gardens, not to mention a full-fledged winery. This gardener has also blossomed into a savvy business owner. With Steve also working full time as a supervisor for an electrical construction company, Andrea is responsible for the winery's daily operations. The bad news is Andrea has little time for gardening these days. The good news is she has more time to spend with you when you come to visit. The idea for Trout Springs Winery started in January 1995 when aging horses left behind a five-acre pasture. In the spring, an acre-and-a-half plot was prepared for cultivars such as Marashal Foche, Leon Millot, St. Croix, St. Peppin, La Crosse, and Swenson's Red. These first cuttings had to be root stimulated in the greenhouse by placing them on propagation mats set at 80 degrees. Once callused, the leaves and roots sprouted, and they were then transferred to single pots to await the April planting. Not knowing how the young plants would fare, a trellising and irrigation system was set up. Amazingly, they grew! The following year and subsequently each year following thereafter, varieties were cultured, culled, and added to find a few prime cultivars that would thrive in our climate and fill the five-acre site. ​Trout Springs Winery realized its first big harvest on Sept. 8, 2001. With over 20 friends and family members prepped and readied, the harvest began that Saturday morning. Expectations were exceeded as approximately 1 1/2 tons of "Reds" and about 600 pounds of "Whites" were gathered. The rest, as they say, is history.